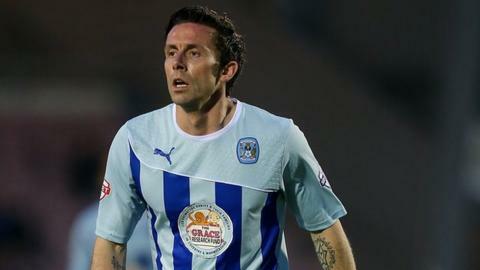 Midfielder David Prutton says he has not spoken to Coventry City about staying with the League One club beyond the end of the season. Prutton, 32, joined the Sky Blues on loan from Championship Sheffield Wednesday in March and is out of contract at Hillsborough in the summer. "I came here to shore us up and try and keep up in the division," Prutton told BBC Coventry and Warwickshire. "Hopefully when that's sorted, it's a conversation for then really." Prutton, who began his career with Nottingham Forest, scored once in 10 appearances for the Owls before joining Coventry until the end of the season. With his deal set to run out with his parent club, Prutton is still in the dark about what might happen next season. "Hopefully I'll be playing football somewhere - but, as for where, I really don't know," he said. "My situation mirrors thousands of footballers in that you get to end the of the season and see where you are." Prutton is hoping discussions over his future with the Sky Blues can begin once the club has secured its future in League One. A win over champions Wolves at Northampton on Saturday would achieve that after the club began the campaign on minus 10 points.